Orange zest, grapefruit peel and mango are pungent on the nose with a fresh whiff of pineapple, melon and a touch of honey. The palate opens up with citrus, tropical fruit, hints of spice and honey, then appearing are mango, melon, pear, orange, lime and papaya. It is satisfying and refreshing with bright, Equanot and Saphir hop sensations and nuances of Belgian spice. 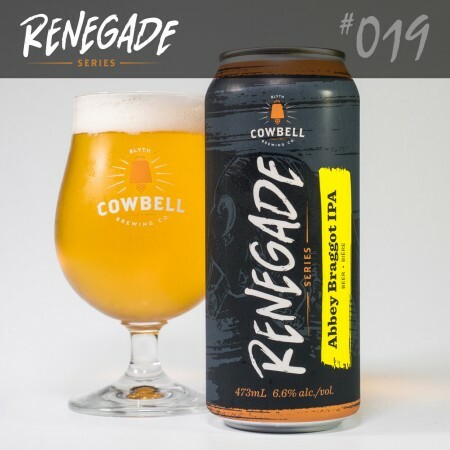 Abbey Braggot IPA will be released on June 29th in 473 ml cans exclusively at the Cowbell taproom and retail store in Blyth. It will also be on tap at Cowbell and select bars in Ontario during the month of July.